Summary: Building on an understanding of the dynamics of communication, this book develops a strategy for navigating difficult conversations through asking four key questions of those with whom we differ.Difference is a given of life. Difference can make life delightful...or disturbing. What can be tough is when two people in some form of significant relationship differ and have to figure out how to make life with each other work. It happens between spouses, parents and children, business partners, and political leaders.Tim Muehlhoff, a professor of communications, knows all about this. He begins his book with a married couple who come to him with manila folders stuffed full of documentation of the grievances they had with each other. In various settings, he has worked on communication issues with families, men and women, college students, faculty and others in the public and private sectors.He begins the book laying out some basic truths about communication. He explores how powerful words actually are. He outlines the various causes of conflict including poor communication climate, differing views of reality, lack of credibility, relational transgressions, lack of small talk, and latent conflict. He discusses the necessity of managing and expressing emotions in conflict. And he considers the role and importance of our spiritual disciplines in helping us with our self-control and self-talk.All this lays the groundwork for four basic questions to ask in difficult conversations:1. What does this person believe?2. Why does this person hold this belief?3. Where do we agree?4. Based on all I've learned, how should I proceed.He argues that these questions work to promote understanding in difficult situations because of the rule of reciprocity. When I make a sincere effort to understand another person on their own terms and look for the things we hold in common, it often creates a climate where the other sees themselves as obliged to do the same.The final question is important. He elaborates it in the chapter as follows: "With this person, at this time, under these circumstances, what is the next thing I should say?" It takes all we've learned about the person through the first three questions under consideration. It considers timing--is this a good time to have this conversation? It considers circumstances--are they conducive to a good conversation? And it focuses on a very specific goal, a manageable agenda--not everything I would ever want to discuss with this person.The book concludes with three "case studies" of applying this strategy: a disagreement between spouses about finances, a disagreement between work colleagues about religion, and a difference between parent and teen about video games and grades. The dialogues are believable and illustrate a deliberate effort to walk through the four questions.I found this one of the most helpful books on communication I've read because, while rooted in theory, it didn't become lost in it, but provided very practical steps and illustrations that helped this reader think about how I could actually practice this in the next difficult conversation I face.He concludes the book with a quote from The Miracle of Dialogue by Reuel Howe:Dialogue is to love, what blood is to the body. When the flow of blood stops, the body dies. When dialogue stops, love dies and resentment and hate are born. But dialogue can restore a dead relationship. Indeed this is the miracle of dialogue: it can bring relationship into being, and it can bring into being once again a relationship that had died.Powerful words that seem so crucial for our time. What Muehlhoff does is point us away from the death-dealing discord of our culture to this life-giving dialogue. This was a satisfying book for what it's trying to do--provide some basic guidelines for how to handle difficult communication. I most appreciated the spiritual disciplines it outlined along with those difficult conversations. I was reminded yet again of how hard it is for me to ask questions and not spend distracted time in conversations thinking about what I'm going to say. I was also impressed by the reminder that I need to not assume I know what the other person is going to say about an issue but be open to being surprised. In his book on how to have "difficult conversations with truth and love", Tim Muehlhoff presents a 4-step method for having good conversations. Muehlhoff brings philosophy, contemporary social studies, contemporary psychology and biblical wisdom together in a book that attempts to provide the reader with the necessary tools for having meaningful conversations with others. I would highly recommend this book to everybody. See my review on my blog. I Beg to Differ is about having difficult conversations in a loving way. Muehlhoff discusses the communication environment and outlines a basic approach. First, find out what the other believes, then why they believe it. From that identify common ground. Only then consider what is the next best step to take with this person. This is a helpful, informative book. 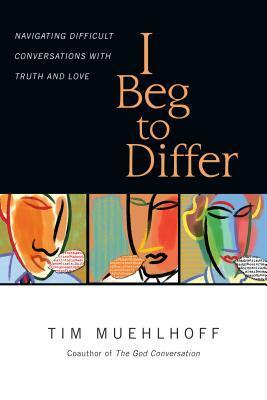 Here is an overview from the author (page 15): "I Beg to Differ" introduces readers to a four-part communication strategy for the most difficult of conversations – those we wish to revisit and those we have yet to broach. The strategy centers on four essential questions that an individual must ask during an encounter with someone from a markedly different perspective. Gleaned from communication theory and the wisdom of the Scriptures, it values dialogue over debate, acknowledging and entering into a person’s story, cultivating common ground, acknowledging doubts, and tailoring our communication to a particular person. These principles will not only work in face-to-face encounters but with the uncivil and often ugly exchanges that happen on Facebook or Twitter. I enjoyed that book and would recommend the author's principles. This book is fantastic. Every chapter presents a very useful tool for communicating, and has an easily referenced summary section. While it is a Christian book, it is not cheesily so. The author references the Bible, but doesn't take it out of context in order to fit his meaning. I would highly recommend it to anyone. Really good practical advice interwoven with Biblical exegesis. Muehlhoff is definitely a little "soft" at points, but my need (why I picked this book up in the first place) is coming from the other direction. I especially liked his discussion of "ethos," as well as the extended description of reciprocation and its importance in communication. When I suggested this book for our church staff to read together, we looked forward to good discussion and practical handles on communicating more effectively in ministry and in our personal lives. Very helpful both personally and professionally. Book was not exactly what I had in mind. But I did pick up a few pointers and overall I would recommend the book. A very useful book for anyone who want's to learn to communicate more effectively. This is a thoughtful book to help navigate difficult conversations. Of course, always easier said than done, but good to meditate on so that hopefully when we enter into difficult conversations, practicing the method posed in this book would become second nature. Very helpful, though challenging, advice. Tim Muehlhoff - Tim Muehlhoff (PhD, University of North Carolina at Chapel Hill) is a professor of communication at Biola University in La Mirada, California, where he teaches classes in family communication, interpersonal communication, persuasion, and gender. He is the author of I Beg to Differ and Marriage Forecasting, and the coauthor of The God Conversation: Using Stories and Illustrations to Explain Your Faith and Authentic Communication: Christian Speech Engaging Culture. Muehlhoff and his wife, Noreen, are frequent speakers at FamilyLife Marriage Conferences, and he has served with Campus Crusade since 1986. They live in Brea, California, with their three boys.